ZB1200C-430 sheet-feeding paper bag making machine is an excellent choice for manufacturers to mass produce mid-range and top grade handbags of high quality. Meanwhile, it has been recognized by customers at home and abroad due to its superior performance and quality. The up-to-standard operation procedure and advanced data management solutions of this sheet fed paper bag making machine make the bag making process stable and speedy. 1. 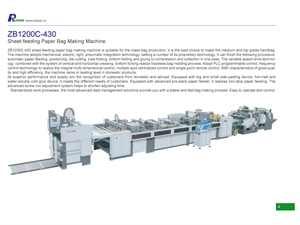 ZB1200C-430 sheet fed paper bag making machine integrates technologies from mechanics, electrics, lighting, pneumatics and finishes all at once automatically paper feeding, positioning, creasing, tube folding, bottom folding, gluing, compressing, and collecting. 2. By the adoption of PLC programmable control and frequency control technology, the sheet fed paper bag making machine achieves integral multi-dimensional controlling, multiple spot centralized controlling, and single point remote controlling. 3. This sheet fed paper bag making machine can produce traceless bags because it employs variable speed drive technology and vertical and horizontal creasing system. 5. It satisfies different needs of customers due to its equipment of big and small side pasting device, as well as hot-melt and water-soluble cold glue device. 6. It conducts non-stop paper feeding due to its employment of advanced pre-stack paper feeder. 7. This sheet fed paper bag making machine shortens adjusting time due to its advanced screw rod adjustment system. Enhanced Pre-Stack Paper Feeder: non-stop paper feeding, shortening time in loading and adjusting the raw paper. Front and Side Guides: accurate positioning of every sheet by the align guides, guaranteeing the uniformity of every batch. Gluing System: It adopts both hot-melt and water-soluble cold glue for pasting, between which the hot-melt glue device can be used separately and the water-soluble cold glue with tape roll adhesive gluing system. Screw Rod Adjusting Device: The screw rod adjustment system shortens the adjusting time and improves the production efficiency in making handbags of different specification. Gluing System（water-soluble cold glue）:Water-soluble cold glue (with tape roll adhesive gluing system). Gluing System (hot-melt glue):Hot-melt (with spray gun adhesive gluing system). Automatic Collecting System:It is able to set the amount for each package; capable of automatic counting, inserting marker, which makes it simple for mass production and it also reduces labor costs, improves working efficiency. Kraft paper, art paper, white board paper, and white cardboard (including film laminated paper) are all applicable on this sheet fed paper bag making machine.